At our February 2019 Meeting we had a fascinating presentation from Ian Marsh covering not only his involvement as a Test Centre Inspector but also the general purpose and activities associated with MoT Vehicle Checks. (His presentation can be viewed by clicking on the link below). 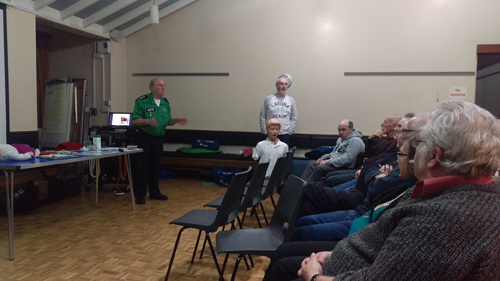 At last evenings event we had Andy Jeynes, a “Silver Commander” from the West Midlands Ambulance Service delivering a talk on Heart attacks and defibrillators. Andy Jeynes has over thirty years in the Ambulance Service and currently works with BHF and the National Resuscitation Council on defining rules and regulations around the placement and use of defibrillators. Andy told us that the Ambulance Service are working to create an Mobile Phone App that maybe be available as early as spring time next year, which will give accurate and current positioning of all locally registered defibrillators that can be used by anyone in need of one in an emergency. A number of different manufactures equipment’s were laid out to view as he highlighted some of the main differentiation between one and the other. The battery and how many shocks it could deliver were amongst the main things. Andy talked about what happens when a 999 call goes through to the Response Centre and how technology today allows the ability to accurately locate the caller’s position anywhere in the country. Also the fact that the Ambulance Service will stay on the line with the caller until the crew arrives. 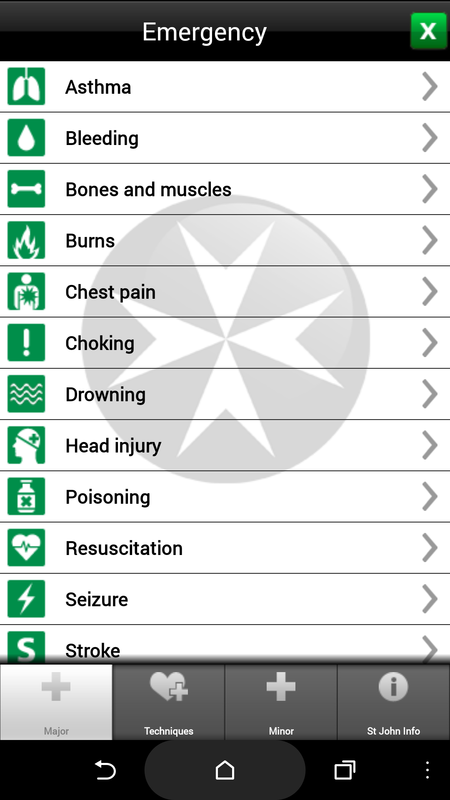 The Ambulance service will know the location of all the local defibrillators that have been registered and can, if need be, direct you to the nearest one. Andy did point out there will be a defibrillator amnesty campaign next year to allow the registering of your defibrillator. He noted that there were probably hundreds that were not registered and the service would not beware of them. The talked then centred on the “Chain of Survival” four steps to saving someone’s life. The point was made that early CPR could possibly extend the time the heart would fibrillate (“wobble”). Technically known as VF, (Ventricular Fibrillation) this “wobble” is when the heart is in cardiac arrest and is not pumping to the correct rhythm. Using CPR on it’s on will not change this but by keeping the heart oxygenated, using CPR, you can buy some time to get the defibrillator. This is the only thing that will save your life, the defibrillator needs to be used as quickly as possible as these units automatically detect the state of fibrillation then apply the corrective action necessary including, in many cases, stopping the heart altogether with a powerful electrical shock, (typically between 100 and 200 Joules), and then allowing the re-establishment a rhythmic beat. This rhythmic beat is controlled by the sino-atrial node. This action does not of course diagnose the problem that caused the ventricular fibrillation however the key thing at this stage is to maintain blood flow and extend life until more capable facilities are available. If you are on your own don’t stay with the victim doing CPR if a defibrillator can be easily accessed, go and get it! If there is someone with you then send them, and you start the CPR. The chance of survival reduces by around 8% per minute in a cardiac arrest so you have little time to get the heart beating again remembering that blood circulation is the key focus of your attention whether that is by thoracic compression or through the use of the defibrillator..
All in all a very interesting evening delivered by a true professional. By the way stay away from the Golf Course, apparently this is the most common place for cardiac arrests! The Group Treasure Hunt was enjoyed by all and benefited from the excellent weather. The following was written by two of the Group Members, Peter and Pat Sills. We would really like to say how much we enjoyed the Wolverhampton Advanced Motorists Treasure Hunt that was held on Sunday September 9th 2018. Arriving at Himley, we were welcomed by Nigel Packer, who gave us our instructions and as ‘Team 4’ driver and navigator, we were registered and soon on our way. The instructions were really clear and it was great fun to look for the clues and to work out a few cryptic challenges (or not!). As we motored on through the Staffordshire countryside looking for answers, we caught up with other teams and exchanged good natured ‘banter’, secretly hoping we’d got there first! We thought we knew the area very well, but were amazed to pass through villages and hamlets, seeing properties and landmarks we had no idea existed. We even encountered a vintage tractor rally. Respect for some of those drivers, on the narrow lanes! Morning challenge over, we were able to enjoy our picnic in Ackleton Village Hall, take a stroll around the village for a few more clues, attempt a few possible tie break questions and then get set for the afternoon directives. We learned so much. Had no idea that an ABUS is a padlock and that a great deal of related information can be seen on one. Older signposts often measure distances in small fractions of a mile. Quick think back to secondary maths, to convert quarters to eighths and then ‘hey presto’, we could solve the clue and then move on. 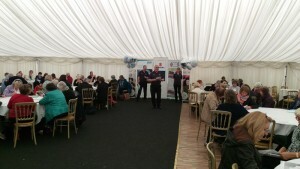 Welcome finale at Halfpenny Green Vineyards, where we enjoyed chatting about our experiences over tea and cakes. It was great to meet David Gallagher, who joined us on the treasure hunt. As the Young Driver’s Ambassador for IAMS, it is very refreshing to know that there is youthful interest. We do hope more Members will participate in a similar, future event. Thoroughly recommended. 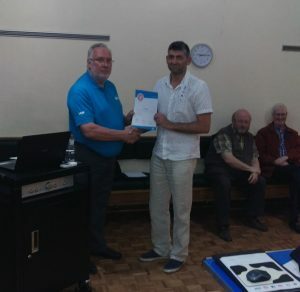 We were very lucky to have Danny Parkes attend our monthly Group Meeting on 11th July and talk to us about his involvement with the forensic analysis of CCTV and digital camera images. Danny, an ex-Royal Marine, gained an HND in Electrical Engineering and eventually made his way to West Midlands Police where he found that the interpretation and use of imagery within investigations was way less than it could be and in many cases information was inadvertently being misinterpreted or ignored. Using his skills in both computing and also electrical engineering Danny became a leading advocate of the accurate use of imagery and the effective presentation of that imagery to the Courts. Often commended for his skills in this area, Danny formed the CCTV Division of West Midlands Police and as Head of that Group effectively defined the standards for the use of CCTV by the Police and subsequently by the Courts. It was fascinating to understand better how images can be used to determine more than just the identity of the persons shown but, in many cases, the true sequence of events and how, what is apparently happening in the imagery may not be true. Many examples of such situations were given throwing light onto the importance of having skilled “eyes” on the images being viewed as often even simple things like the timing can be inaccurate as a result of the “fragility” of the time indexing on even modern video recorders. A discussion ensued as to the importance of Dash-cams in the current driving environment with emphasis on quality though it was agreed that something is better than nothing though wherever possible a decent recording period, (a few days), associated with true HD was by far the best when choosing a dash-cam. To access our previous Technical Article on this subject please click here. Wolverhampton Advanced Motorists again attended the Himley Mini Show. 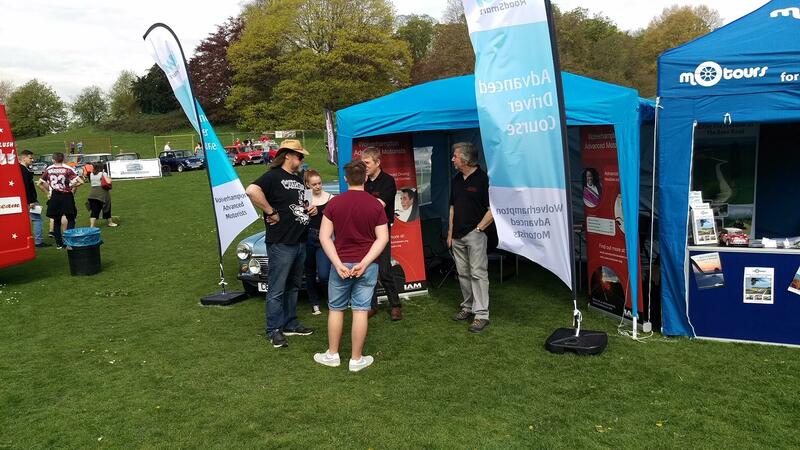 We had a stand adjacent to Ryland Mini which helped us with people stopping to have a chat. 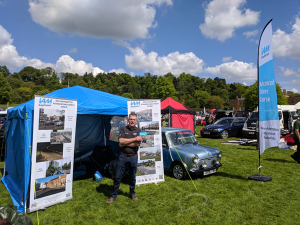 We were also lucky enough to have the near concourse standard Mini Mayfair owned by one of our Observers on the stand which was a great talking point. A good number of leaflets inviting people for Free Assessment Drives were handed out and discussions were had with a fair few younger drivers who were interested in the offer from the Group to reimburse them their IAM RoadSmart joining and Membership fees on their passing their Advanced Driving Test. The weather was better than it had been for a while and it was certainly a good day for everyone involved. Wolverhampton Group attended the Region 4 Spring Update Meeting managed by IAM RoadSmart and held at The Young Farmers Club at Worcester on Saturday 21st April 2018. 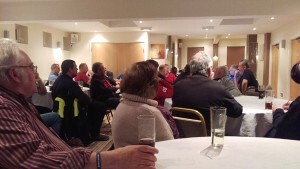 The meeting was, as it always is, very well attended with all but one Group from the Region attending. The primary purpose of the day was to give IAM RoadSmart the opportunity to update the Groups with latest good practice and other changes that are being implemented in the management of the IAM. The principal focus of the discussions was the implementation of the new data protection rules that are coming into effect within the next few months. (GDPR). The effect on all Groups will be substantial though Wolverhampton Group is well placed to embrace the new practices having already started to take steps towards their effective implementation. The following are the notes that were taken by Roy Richards, (Group Chief Observer), who attended the meeting on our behalf. On 11th May 2018 we were lucky enough to have Steve Ellis, (ASDM and unofficial Ambassador for The Masters programme), give a presentation on the Masters qualification. The Meeting was well attended with both Rider and Driver guests from other local Groups present. 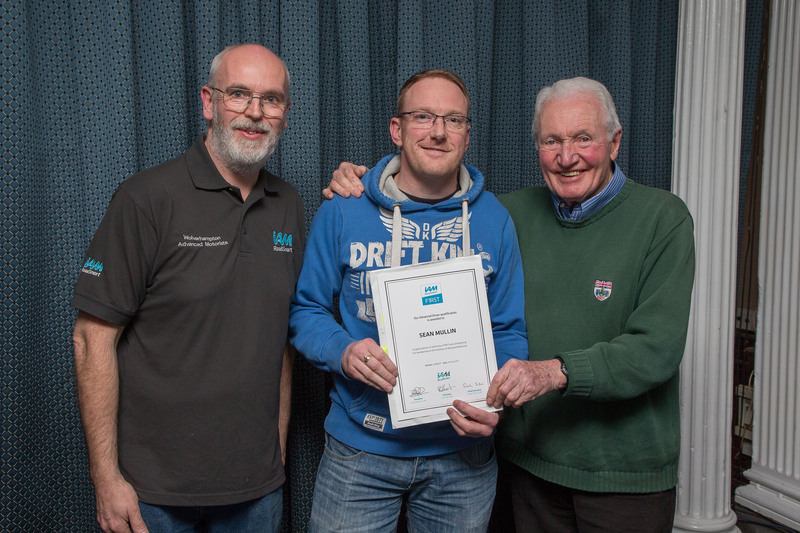 Attendees ranged from Associate to Master Mentor level so representing all aspects of IAM RoadSmart. Steve gave a compelling and interesting presentation of not only the values enshrined within the Masters but also the practical aspects of the test. (As an ASDM he is one of the Examiners for Masters). The presentation was interactive and raised many questions from those present about aspects of driving at a Master’s level. 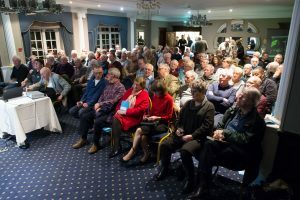 Many misconceptions were cleared and in a straw poll at the end of the meeting it was seen that from the forty plus people attending that at least five were now seriously considering doing the Master’s as their next step in advanced and safer driving. Should you want more information then the details below provide the basics, there is more detail available on the IAM RoadSmart web site and, should you be seriously considering doing your Masters and want to talk with someone then you can e-mail us by clicking here and we can, if you wish arrange to get together. We have made our Masters course even better. Our Masters course now includes a simpler scoring system, new logbooks, new badges and logos and updated Mentor guides. 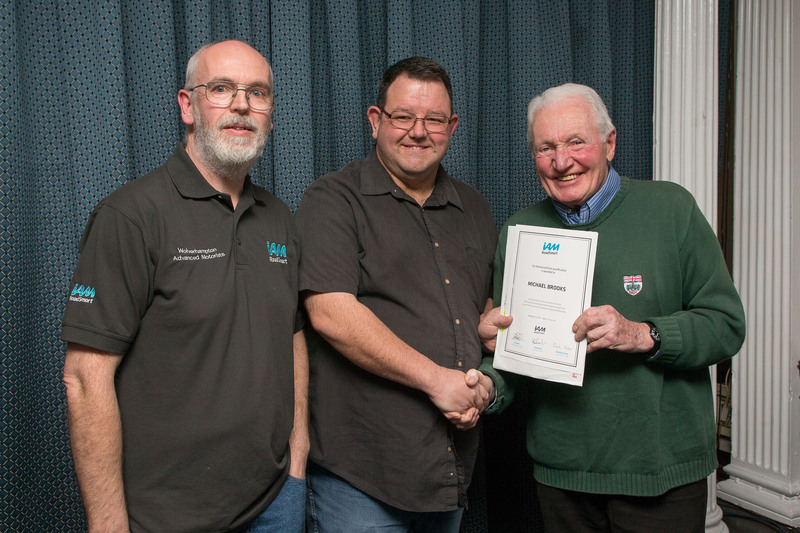 Open to all current IAM members, the IAM RoadSmart Masters programme provides true one-to-one mentoring support and guidance that will help you to attain the highest standard of civilian driving or riding ability in the country. Once you and your mentor feel that you are ready, we will offer you a ninety minute test that includes both a theory session and an extended drive or ride. To challenge you the Masters test will be conducted on roads unfamiliar to you, and may therefore involve travelling a fair distance from where you live. You will be scored on a series of criteria and able to achieve either a Pass or a Distinction award. The Masters test will be conducted in a location away from your usual driving or riding roads and may involve a journey of up to 100 miles. The Masters test will challenge you to drive or ride on roads that are unfamiliar to you. Our Masters qualification is valid for FIVE years after which time we will invite you to re-qualify. The current price of the re-qualification is £129 and upon passing you will be awarded either a Pass or Distinction and the online Register updated. Our Group Evening with Paddy Hopkirk and David Gallagher was a huge success. If you were unable to attend then you missed a memorable evening. We were supported by not only a good number of our own Group Members but also other local Groups, Walsall, Redditch, Lichfield, Stafford and Kidderminster as well as a fair number of potential new Members in friends and family, over a hundred people in total attending. David Gallagher gave a presentation of interest to all drivers but with a special focus on how to reduce driving incidents involving the younger or less experienced person. Focusing on effective approaches rather than just statistics demonstrating the risks, David left all attending with some thoughts on how to best engage younger drivers in adopting and gaining improved driving skills including IAM RoadSmart based initiatives such as the “1,000 Free Training Modules” that are now available to the under 26’s and the newly launched “App” to guide and engage the younger driver. His presentation was very well received and rightly so. 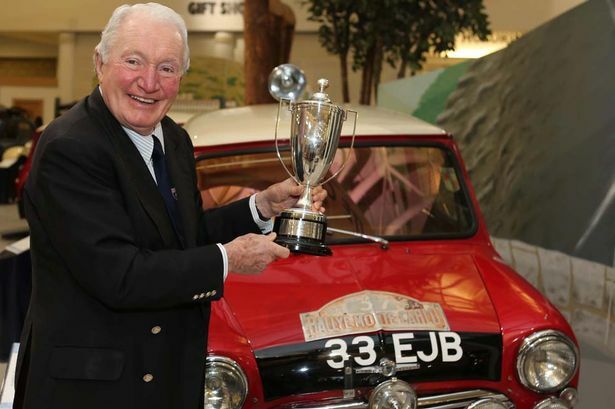 Following the refreshment break Paddy Hopkirk took to the floor. He initially presented three of our Members with their recently gained Certificates, David Barley, Michael Brooks and finally Sean Mullin who gained a straight “1’s” F1rst. Paddy was kind enough to sign photographs of the presentations for the three new IAM RoadSmart Members making their awards that little more special. 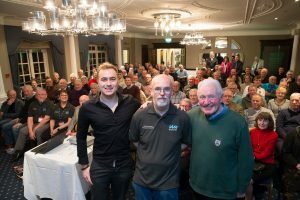 Everyone was then treated to what could only be described a gentle romp through Paddy’s history from his first car through to his current successes including his being elected to being President of The British Motor Racing Drivers Club. 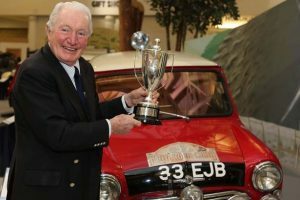 His humour and eclectic choice of photographs had everyone laughing and made for a thoroughly entertaining hour bringing back to everyone the massive importance of the mini within British motorsport and also to driving in general. 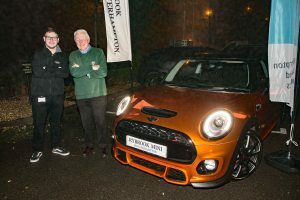 We were very lucky on the night to be supported by Rybrook Wolverhampton Mini who bought along one of their cars to show the amazing differences between the cars that Paddy was driving so successfully in the 1960’s and those now being sold. Rybrook had their Mini Product Genius, Tom Lagram attend so there were no questions that could not be answered. (The Rybrook Wolverhampton Mini Web Site can be visited by clicking here). Additionally one of our Group Members, Roland Sellors, bought along a friend, Chris Nutt of Codsall Photographic who graciously agreed to act as “Court Photographer” for the evening taking professional grade photographs for us at very close to no cost. It was thanks to him that we were able to produce pictures of the Certificates being awarded and get them signed by Paddy during the course of the evening. Other supporters of the event that need to be mentioned are Richard Dodd of Signal Radio, (also a Group Member), who lent us a PA system and The Mercure Goldthorn Hotel who, though we were renting the room from them, did way more than would normally have been expected, even contributing a prize for the raffle. 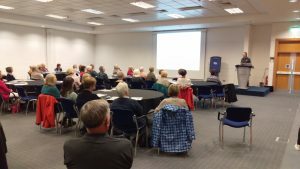 David Gallagher and Kathryn Ball had opportunity to attend the Kidderminster Group Observer Evening on 25th October 2017. 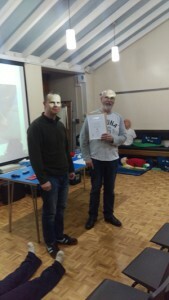 There were attendees from Redditch Group as well as Bob Chambers one of the local Examiners. Under what circumstances is it acceptable to not use indicators? Automatic cars temporally stopped at traffic lights – handbrake or foot brake? The importance of developing a good relationship between Observer and Associate. Runs scores should be scored 1-5 rather than 1-3. Allows a more nuanced assessment. Recommend that Observers share the ‘Hints and Tips’ with Associates. People mentioned a DVD IAM produced some years ago which was apparently excellent and is still used by some Observers. 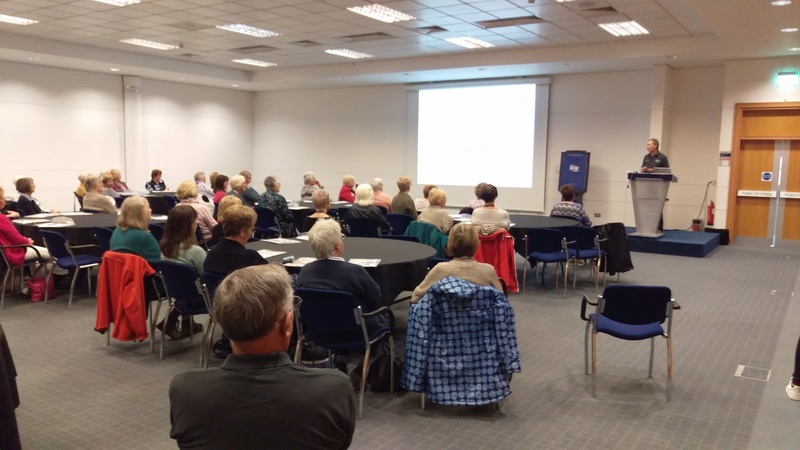 On Saturday 16th September Wolverhampton Advanced Motorists supported IAM RoadSmart at the third of their WI Events, this time held at the British Motor Museum at Gaydon. Though the weather was not quite as good as it could have been it was just damp rather than wet so made it a most pleasant day and a great day for drives. There were sixty ladies from the WI led by Lynne Stubbings, (Chair of the NFWI), who had a full day with IAM RoadSmart; three training modules were presented by staff from Welwyn Garden City, whilst Observers assisted with with slow manoeuvring practice on one of the car park areas and drives in the surrounding country. The modules presented were on Winter Driving, Distractions and Speed Management. The drives presented opportunity for the involved Observers to do Assessment Drives and cover any specific concerns or issues that the ladies had about any particular aspects of their driving. (One participant spent the whole of her forty five minute drive on the nearby M40 as she had concerns about Motorway driving). The day went very well and a good deal of fun was had by everyone present. 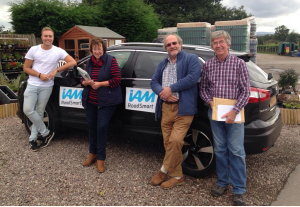 The ladies received the information very positively as was indicated by over half of them signing up to become members of IAM RoadSmart, an exceptional result for any day. 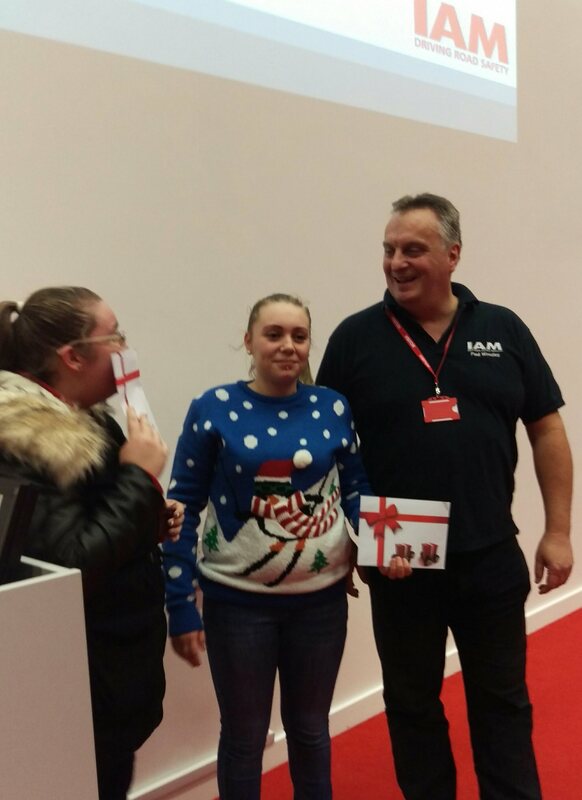 As always Wolverhampton Group do their best to be a key part of the development of IAM RoadSmart and are always happy to promote the progress of road safety. 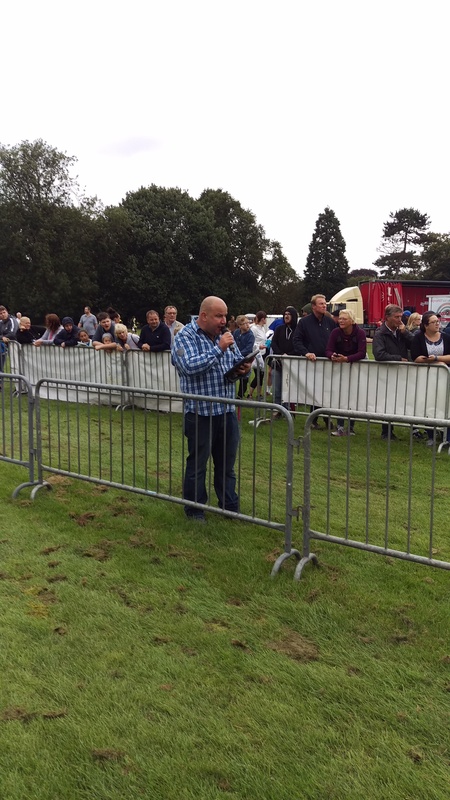 For the first time in many years WAMG attended the Wolverhampton Marathon. We had a great location adjacent to the Start/Finish line and directly opposite Signal 107 which was primarily hosted during the day by one of our Members, Richard, (Dickie), Dodd. It was a shame, for those simply attending the event, that the weather was somewhat overcast and on occasions wet however this was excellent news for the competitors. The somewhat dull weather meant that attendance was, we understand, a little down on previous years, however, frequent announcements of our presence by Signal Radio, (thanks to Richard here), did ensure that we had a reasonable number of visitors to our stand which allowed us to pass out well in excess of a hundred leaflets attracting perhaps a few new members to the Group. Certainly we will be attending the Marathon next year and would welcome support for the day from any Member of the Group reading this. 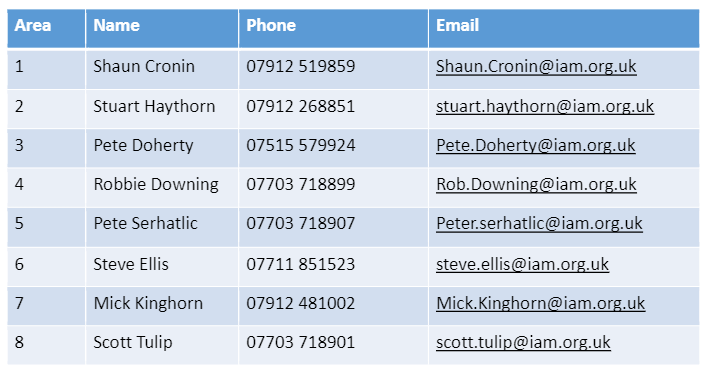 (Just talk with any member of the Group Committee if you can help us at events). 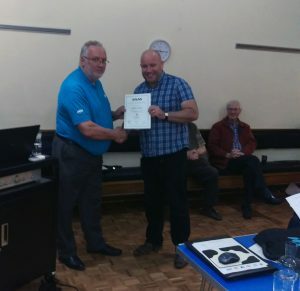 The AGM this year was a real cause for celebration this year with five F1rsts being achieved within the last two months, three from Associates and two from long standing Members, (Peter Spillan and Alan Bates), who decided they wanted to test that their skills were still up to scratch. Both Peter and Alan are also Observers within the Group leading by example ensuring that our mentors are able to not only guide new Associates but also achieve the results. Dave Shenton, IAM RoadSmart Events Controller, was able to attend our meeting to present the Certificates to the four who were able to come to the evening. Congratulations to Richard Dodd, Peter Spillan, Lee Morris and Alan Bates. Congratulations also to Ric Nichols who, though he was unable to be at the evening, also achieved a F1rst pass. 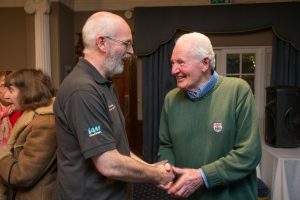 Additional to the above we were able to congratulate two Group Members who have been with the IAM, (now IAM RoadSmart), for 50 Years. 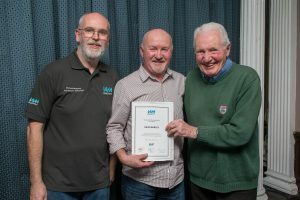 Well done Peter Spillan and Barry Sadler, both of whom received a small gift voucher presented by Dave in recognition of their support and efforts for the Group throughout the years. 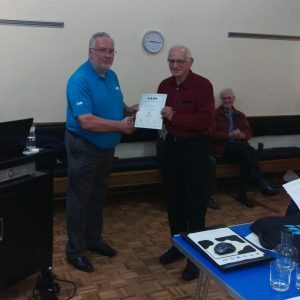 Following the business of the AGM being concluded, (the AGM Minutes are available by clicking here, Dave Shenton gave a very interesting presentation about the changes that had taken place within the IAM since its inception in 1956. This was especially relevant as Dave was closely associated with Wolverhampton Group and was at one stage Group Chair. There were stories of past activities aplenty with support from the longer standing members of the audience who helped recall past Members and some of the more interesting occurrences through the years. One thing that was of interest was that, though we are only having our thirty sixth annual general meeting the Group is actually in it’s thirty ninth year and will reach the “Big 40” in 2018! (Now that is something we must think of celebrating)! The evening was supported by a buffet which did make a pleasant change from the usual coffee and biscuits and helped enhance the general feeling that this was a night to be proud of for our Group and look to how we could make things even better throughout the course of the coming year. Paul Williamson, (Group Chairman), did mention that we would be contacting all the Group Members within the next few months with a short questionnaire looking to better understand what the Group Members really want from the Group. A presentation given by one of the Group Observers, Alan Bates at the January 2017 Meeting. For those of you who couldn’t make it you missed a really interesting evening detailing the complications and challenges that were encountered by the team building the tunnel under the River Ouse. A surprising amount of complication to get two water pipes from one side of a river to the other. Challenges mostly related to the use of a high pressure air system of working in order to ensure that the water from both the river above and the water table below did not get into the shafts at either end and the tunnel itself whilst it was being dug and subsequently made watertight and sealed. The project details were all the more interesting because of it being done in the 1970’s when the impact of health and safety had not quite made it’s presence felt. Smoking in decompression chambers, lack of safety harnesses, no sign of a high visibility vest! (It was no wonder that the work face miners set their own price for the job being done)! 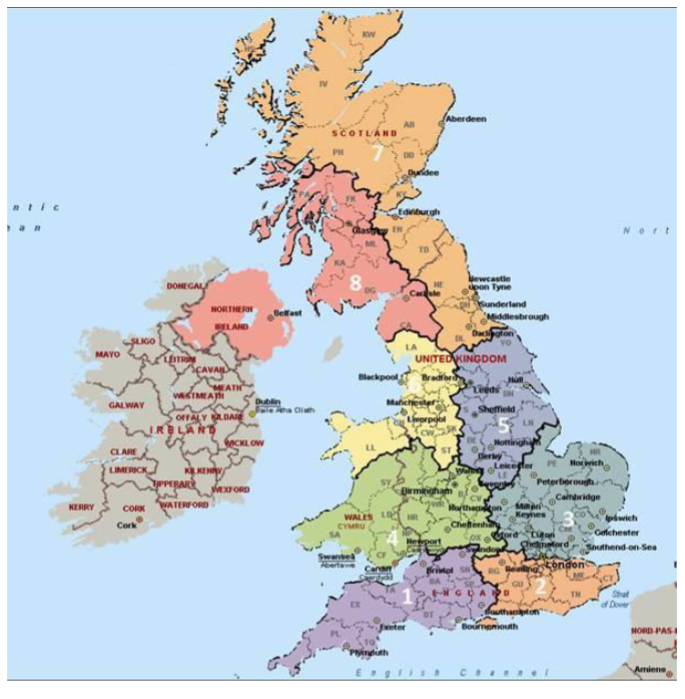 Each of the Area Service Delivery Managers is responsible for managing IAM RoadSmart’s overall business development and operational service delivery within his designated area in relation to the delivery of driving and riding operations, customer service and sales team support. This role will see him liaising closely with IAM RoadSmart’s appointed training and examining representatives such as groups, observers, examiners, fleet trainers, and ADIs etc. He is responsible for ensuring that all IAM RoadSmart standards and qualifications are implemented and adhered to, and regularly quality assessed. He will also oversee the recruitment and Continuous Professional Development of all IAM RoadSmart training and examining representatives. 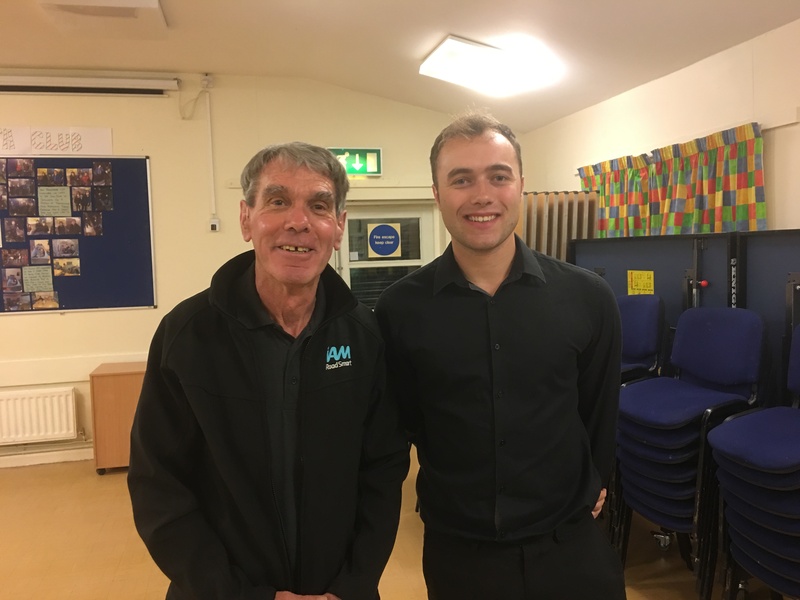 He will also work closely with the IAM RoadSmart groups in his area with a view to helping them continue to grow IAM RoadSmart advanced driver and rider recruitment. 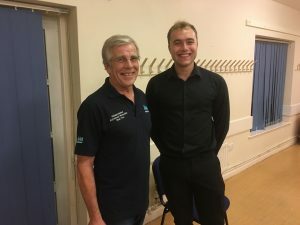 In addition, he will develop and manage ongoing relationships with external organisations and partnerships such as Safer Road Partnerships, Under 17 Club and IAM RoadSmart skills events. Wolverhampton is located within Area 4 and is supported by Robbie Downing who is our ASDM. Details of all of the ASDM’s are shown in the table below. 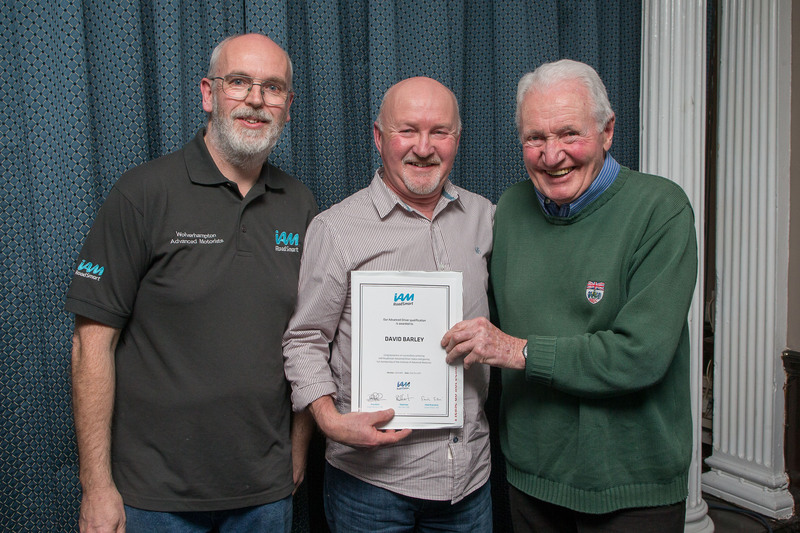 Robbie has been a Car and Motorcycle Examiner for IAM RoadSmart since 1988. More recently, he has been a member of the Avon and Somerset Driver Training Unit delivering and assessing not only car and motorcycle courses from basic level up to Class 1 Advanced Level (including pursuit courses) but also HGV and PCV training to DVSA test level. Between 1995 and 2010 Robbie was responsible for the Force Ride to Arrive and Bikesafe motorcycle road safety initiatives which were aimed at motorcycle collision reduction for members of the public. The following presentations were given by IAM RoadSmart at the 2016 National Conference held on 22nd October at Aston University. Further information about the conference can be found in the Autumn Wolverhampton Advanced Motorists Newsletter which is available by clicking here. The sun was shining and thousands of visitors enjoyed the fun of the Wombourne Carnival. 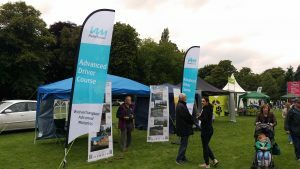 Wolverhampton Advanced Motorists again had a stand within the hall showing off the new IAM RoadSmart logos and livery and attracting a good amount of attention with the continuing offer of free taster drive assessments. (Normally £39 but offered free at the discretion of the Group Committee). As always the Wolves IAM Group tries to both have a presence and show support for local events whilst also hoping to attract new members to the growing band of drivers who want to ensure that their driving skills are up to the demands of current road conditions. Discussions were had regarding the ability to provide what are in effect module courses for people who would like to have some additional training and support on particular aspects of driving, new in-car technology, motorway driving, driving and night and similar. All are available if required. Following the Carnival we are hoping that some of the thirty or so people who did stop and talk with us will follow up and get in touch with the Group. 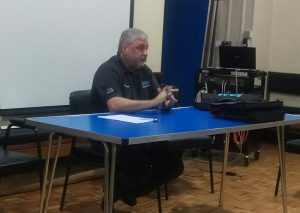 A presentation was given by Nigel Powers from the RCIU. 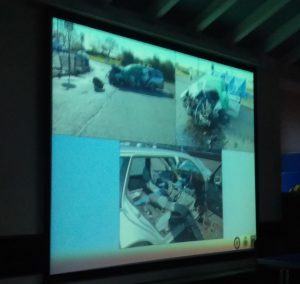 This was a fascinating evening which covered the who, what, why and where of collision investigation within the region as well as talking through a number of cases that the team had been involved in locally. The cases were all supported by the materials that had been presented in court including a multitude of photographs, diagrammatic analysis and also generated 3D animated recreations of incidents; it was clear that in all cases nothing was left to chance or speculation but thoroughly and meticulously investigated and documented. As Nigel said it really is just a case of applying physics, maths and a heavy dose of common sense to a collision scene! Many of the findings presented were quite shocking, cars racing each other at speeds in excess of 100mph, people driving with little consideration for other road users and so it went on each case showing all the details through to the convictions achieved. Much of the detail was quite graphic and the fact that the RCIU only gets involved in collisions where there is a fatality, a near future fatality is expected or a life changing injury has been sustained made the photographs of the collisions and the parties involved all the more poignant. The photographs above are presented here slightly out of focus simply because in both cases the driver was still in the vehicle at the time the pictures were taken. What did come across clearly was that the experience of the sixty plus people team allowed them to create very precise re-constructions of collision scenes from often very little information using, as said, physics, maths and common sense in conjunction with data from previous investigations. This all done by examining tyre tracks, examining the vehicles and taking accurate and extensive measurements of the scene. The presentation continued well past our usual 10pm finishing time as the interaction and details were so interesting and though in many case quite gruesome, also quite compelling. In a number of cases real “looking through your fingers” stuff! If you missed the evening then keep an eye out for the RCIU’s next visit as it really would be worth making the effort to come along. We have asked if we can have a copy of the presentation which we can link to this detail. Keep your eyes on the web site as we are hopeful Nigel will get us something if sightly redacted. The Group AGM took place at The Friends Hall during the evening of 11th May 2016. The formal business of the evening was ably and speedily cleared as shown within the minutes which can be seen by clicking on the link below. 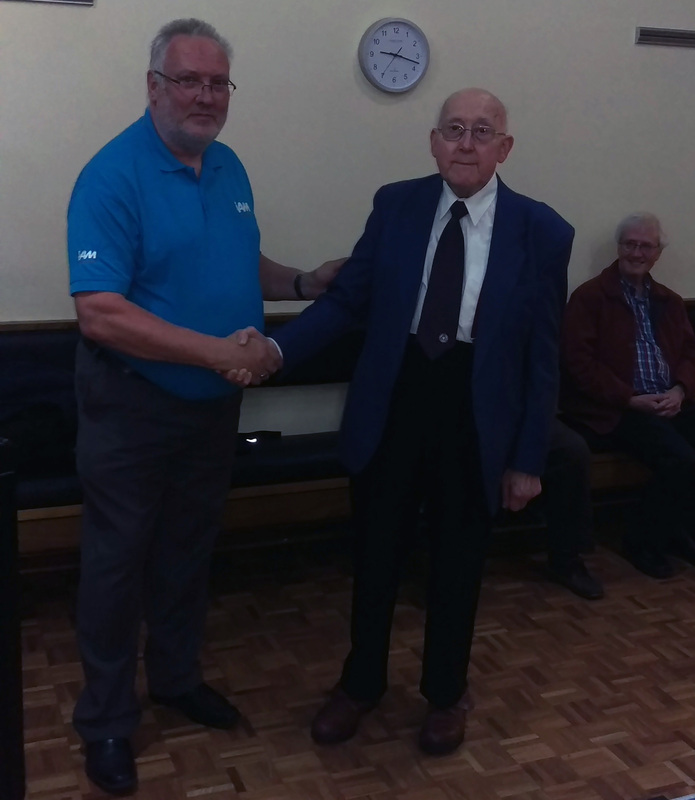 Following the completion of the AGM Pete Doherty, Regional Quality Manager and Senior Staff Examiner, was introduced to the Members. Pete opened the floor to questions following his giving a brief update regarding the development and roll-out of RoadSmart. A draft copy of the new Observers Handbook was handed around and generally agreed to be a very good looking and useful document. Peter explained the forthcoming changes that will be introduced including the new marking system moving from 1 through 5 to 1 through 3 and that their would be a strong and unremitting drive to uniformity of approach throughout the regions and across all Groups. There was discussion regarding the proposed introduction of the new Group Sign-off Membership category. It was understood that there were a number of things yet to be finalized in this matter including the process of sign-off and as to whether Surety would accept the sign-off as a qualified Advanced Driver. Additionally there were discussions about the roles and operational activities of Observers and the needs to speedily handle new Associates and get them driving as quickly as possible. 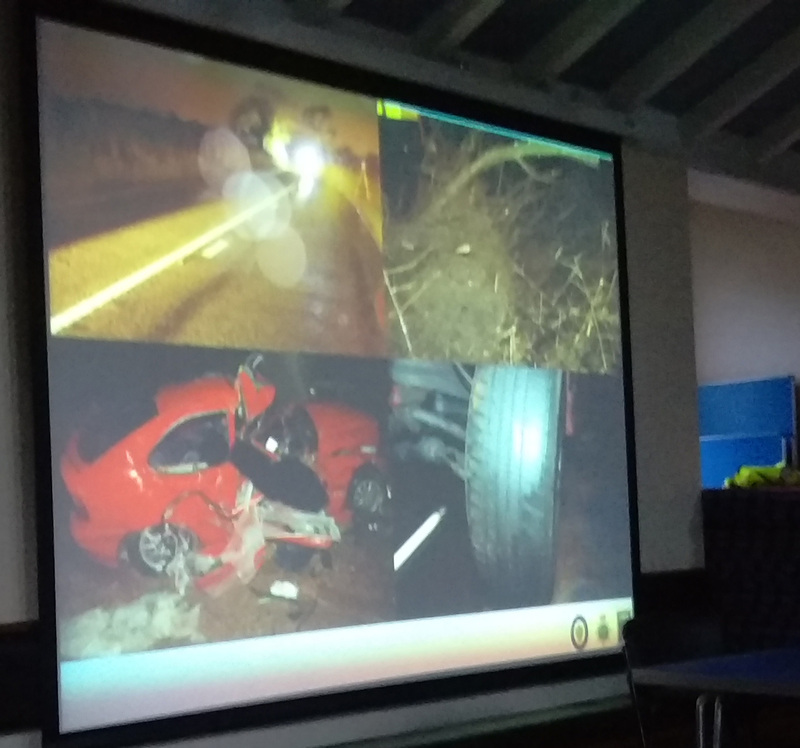 There was also discussion regarding the new modules to be offered to all by the IAM in areas such as Motorway Driving, Night Driving &c. (It is understood that this detail will all be formally introduced at the Regional Launch of RoadSmart in June 2016). The annual Mini Show took place at Himley Hall on 8th May 2016. It was a gloriously sunny day, thankfully after the previous night’s downpours. There were Mini’s of all sorts and casts and ages from pre “A” registration right the way top the latest BMW variants. 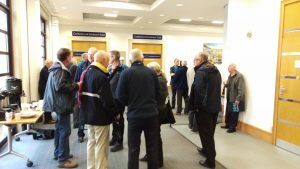 The Wolverhampton Group Stand at the show was not overwhelmed but was busy which made for a pleasant day for the Members who gave up their time to support the event. (Proximity to the lake helped with the heat though the adjacent ice cream van did challenge the sweet toothed). This was the first time that we showed of our new RoadSmart livery which looked very smart. For more photographs of the cars please click here. 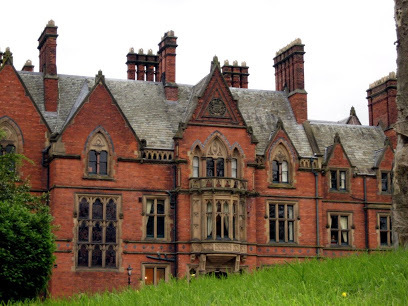 Wolverhampton Group National Observers, Roy Richards and Jonathan Hughes were invited to support the IAM – WI Event being held at Wroxall Abbey Hotel on 23rd April 2016. The WI had gathered together 125 of their members from all over the country to attend the event. 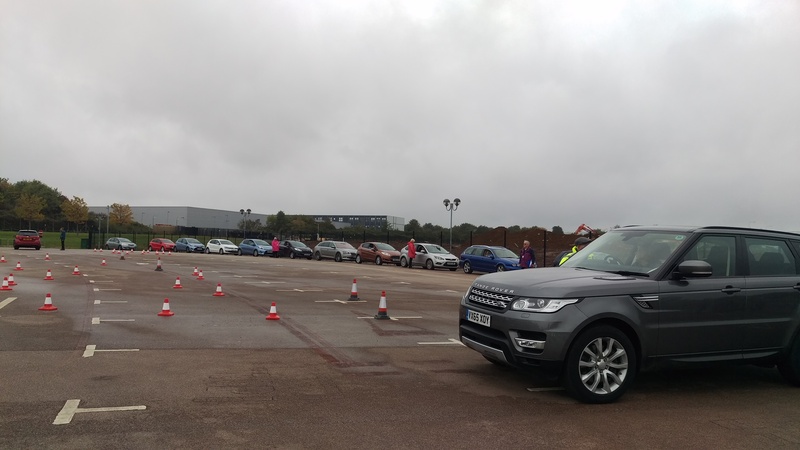 The intention was to provide Assessment/Taster Drives for those 125 along with practical manoeuvring skills training and classroom skills development on such topics as Motorway Driving and Night Driving. The logistics were complicated indeed but ably managed by the Chiswick staff who split the WI members into five groups then had five of the thirty NO’s running the manoeuvring skills sessions on one of the car parks at the hotel whilst three other groups had classroom “training” and the fifth group went for a drive with an Observer. The route that had been chosen for the drive was around twenty miles around various major and minor roads through the beautiful Warwickshire countryside. Most Observers did for or five drives so the route became well known by the end of the day. Weather conditions were perfect though a little chill if you were standing still for any length of time. A great day for the IAM and well enjoyed, (so we were told), by all of the WI members. 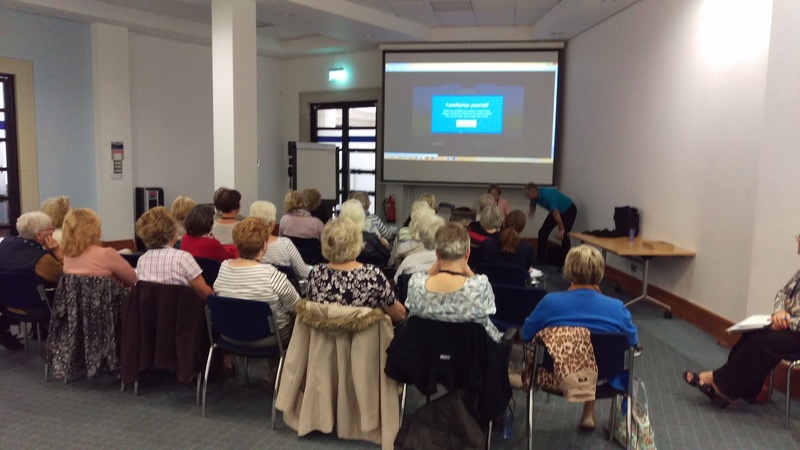 There are sufficient additional WI members who were keen to attend this session to cause there to be a further meeting planned for September. As the WI have 300,000 members in total, getting their interest and perhaps signing them up would be a real coup for the IAM organization. 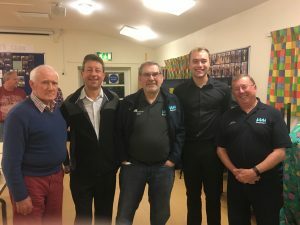 We were privileged to have both Kelvin Street, (examines Masters and National Observers working alongside Pete Doherty), and Steve Tyler, (Ex Hendon – Advanced Driving), attend our monthly Group Meeting to give their insights and thoughts about the Advanced Driving Tests and to answer questions from the audience. 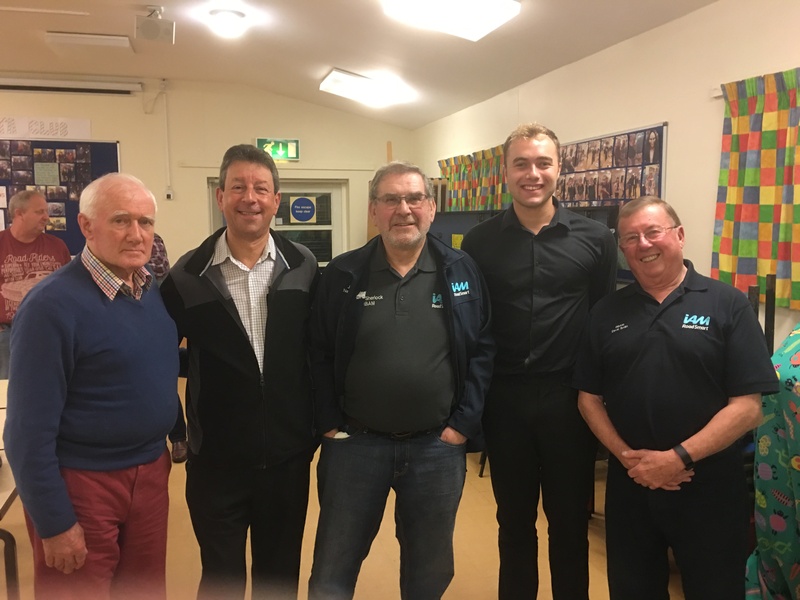 The evening was well attended which was appreciated and showed that we are enthusiastic as a Group and do care about the standards that are being rolled out to Associates as well as allowing for people to clarify points regarding Advanced Driving. In this both Kelvin and Steve are former serving police officers with considerable first hand experience of what not to do to allow them to emphasise what is good practice and effective. Work the system, (IPSGA), and the system will work for you. It will be expected during the test that Associates demonstrate effective use of IPSGA. Be a thinking driver at all times! Is your driving affected by conversation or your conversation affected by your drive? Within the Advanced Driving Test the examiner will generally only expect the Associate to demonstrate perpendicular parking within a car park, probably at the end of the test drive. This would not be the case for a Masters Test where perpendicular parking, parallel parking and reversing around a corner would all be checked. Examiners are trying to pass Associates and are not looking to fail them; the test should be a positive experience for both people within the car. Examiners are always looking for smooth and accurate steering, though Pull-Push steering is no longer mandatory it is considered the gold standard and should be adopted if possible as it does provide effective and continuous control of the vehicle. There is no excuse for speeding at any time; speed limits should be considered sacrosanct. (The only exception to this was if there was an issue of safety that required the speed limit to be exceeded in order to avoid a situation developing further). Brake-Gear change overlap is now acceptable as a part of the test drive. This has changed because of the capabilities of modern cars. Cockpit drill should be understood by the Associate but is not a critical or major factor of the test however knowledge of one’s vehicle is important. Driving aides can be used when they are a part of the vehicle however these should be used intelligently and providing that they do not reduce the safe operation of the vehicle in any way. Overtaking is unlikely to be demonstrated during the test except of stationary vehicles and/or on a motorway or duel carriageway. The Associate may be expected to show that they do know how to set up an overtake situation though consummating that overtake may not be possible because of the speed of the vehicle ahead, road conditions and/or oncoming traffic. It would be expected of a thinking driver that they straight line roundabouts where it is safe and sensible to do so. The test is not about the car but what is happening around the car; what is being seen around the car and how the car is being controlled. On a slightly chilly Wednesday evening, just as the rush hour traffic was finishing we arrived at the Quinton RTCC for our visit. Our Group was in the very privileged position to have a special arranged visit. Unlike so many others who go there they get a very brief look in lasting about 40 to 50 minutes. Similarly a visit to the adjacent National Traffic Control centre last a similar amount of time. For ours we had one of the top Managers Rob and one of his staff gave us not only the usual high level visit. There Centre became operational back in 2005. 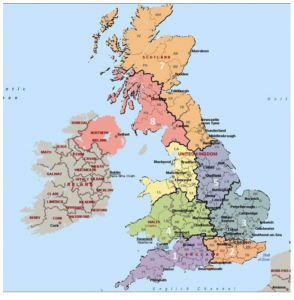 But a more detailed explanation of what the Highways Agency staff, have to meet as targets, what their roles comprise of on a day to day basis. The Centre is one of 5 Nationwide and the Control room is manned 24 hours a day by a number of teams each with a specific area of skill expertise and responsibility all under control of the Shift Manager. This is achieved by three teams both inside the centre and its control room and through the on Road Officers. What happens when a serious incident or multiple incidents occur? How the design of motorways has changed. The risks and issues which are often wrongly associated with all lane running carriageways. The range and number of incidents they deal with is a significant number every day. They reminded us that all of the issues they face come about through the actions, errors and miss-judgements of Individuals who drive vehicles. We were reminded of the importance of having breakdown and roadside recovery insurance options for your vehicles if you drive them on the Motorway and the potential costs and consequences of not having it, should they need use their removal contractors. That hard shoulders are not a safe place and that is its essential you leave your vehicle whatever the weather or time of day to a safer place behand a barrier and ideally up an embankment. We were then privileged to look right behind the scenes and with the permission of the evening top Manager a visit into the actual control room during its operation. Sadly no pictures were permitted to be able to share with you. We were given a detailed understanding of the specific areas and teams on duty what which was responsible for and actually doing. A view of the large and multiple displays they have and a look at the multiple CCTV streamed pictures they have. We got to look closely at one of the spare patrol vehicle. Understand the criteria behind the model selection. The lights and variable message board on the rear. 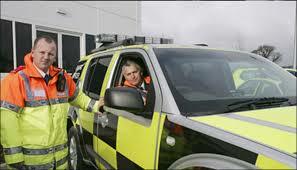 They are only class 2 response vehicle drivers meaning they cannot break the speed limit, even on the way to incidents. They also have quite aggressive phone answering and incident response times. The equipment that the vehicles carry including their self-sequencing (strobing) yellow hazard lights. Some of the other things they carry such as pop-up directional signs, traffic cones. The lights have both day and night light level settings. Our visit was over three hours in total but the time passed by so quickly thanks to the informative and interesting hosts we had. This is another visit I would recommend to any Group members without hesitation and we are looking to re-book again within the next 12 months but on a Sunday afternoon next time. 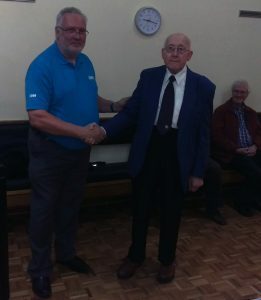 An invitation had been extended to our Group by Mark Harbord, Chair of the Wolverhampton Advanced Motorcyclists, to attend their March meeting. A small Group attended the meeting including our Chief Observer, Roy Richards. The meeting was well attended by the motorcyclists with some thirty five people present, excluding our modest five. 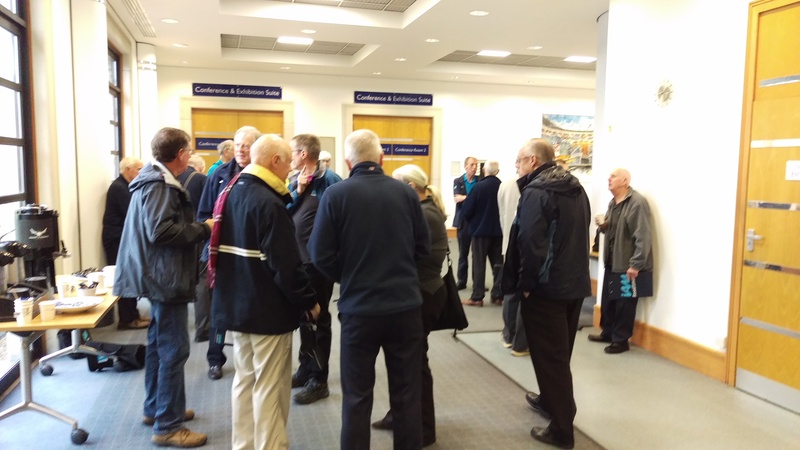 Following the Committee Meeting details being concluded we were given the option to quickly present an invitation to any Riders to also become Advanced Drivers and that they would find a warm welcome should they also wish to gain driving to supplement their riding skills. We additionally suggested that it would be of interest to our Group to have the Riders present their feelings about drivers and the concerns they have regarding the perception of even advanced riders on the road. (In this Mark Harbord agreed that he would keep an eye on our Events Page and suggest a date when he could attend subject to our not having anything else fixed for that night). Riding is of course a very different business to that of driving though safety on the roads is the same goal for all IAM Members and Associates alike. The average age of the Bikers Group is around ten years less than our Drivers Group however the enthusiasm and dynamic demonstrated at the meeting was far beyond a reflection of that ten years. Rider Group meetings at weekends simply to enhance skills and improve techniques, are a clear part of their modus operandi, though they have the same Associate – Observer one to one as we do, they also have ongoing options for Associates to ride with a different Observer simply to extend their knowledge and perceptions and broaden skill sets; the Riders Group is basically way more interactive than that of the Drivers Group; a lead which we could perhaps follow, at least in part. Discussions were had with a number of the Riders and our Monthly Meeting’s having guest speakers and our having visits arranged to such places as Jaguar, the Highways Agency and so on were seen as being very good and something that the Riders did not do so despite the comments above, a big plus for us. (Thanks here to the efforts of our dedicated Events Planner). A number of the Riders indicated their interest in gaining Advanced Driving skills and we hope will be in touch with us shortly, let’s hope we see some new faces soon. This was a worthwhile evening and indicates that there is value in maintaining a friendly relationship with our riding colleagues with a view to improving our own activities. 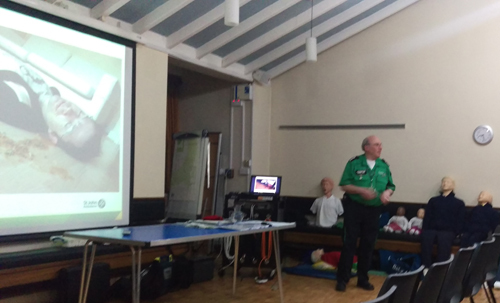 The monthly Group Meeting gave us a fascinating insight to the St. John’s Ambulance Service as well as training in the basics of first aid. Potentially life saving information stressing the point that a few fundamental skills can make the difference between life or death! (No overstatement here but a simple fact)! David Glover gave the presentation which was dynamic, informative and maintained the attention of all who attended. An excellent two hours with practical demonstrations of situation management, casualty diagnosis, treatment methods and communication skills. (We even had opportunity to see and use a defibrillator albeit only on a manikin)! Great slides – bodies and blood everywhere!! Manikins and audience played an important part in the presentations! 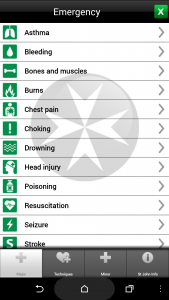 If you have a smartphone download the St John’s Ambulance First Aid App. 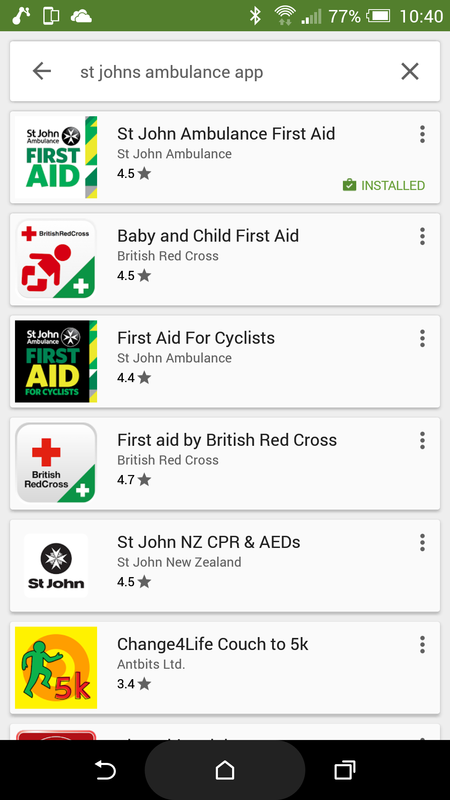 Just go to your “store” location and search “St Johns Ambulance App” and select the App with the Green Words “First Aid” in the square box. 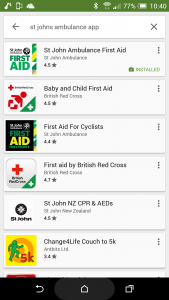 This is a phenomenal application which talks you through how to give first aid in pretty much any situation you are likely to encounter. Spoken word and visuals guide you through what to do … make this your download of the year! 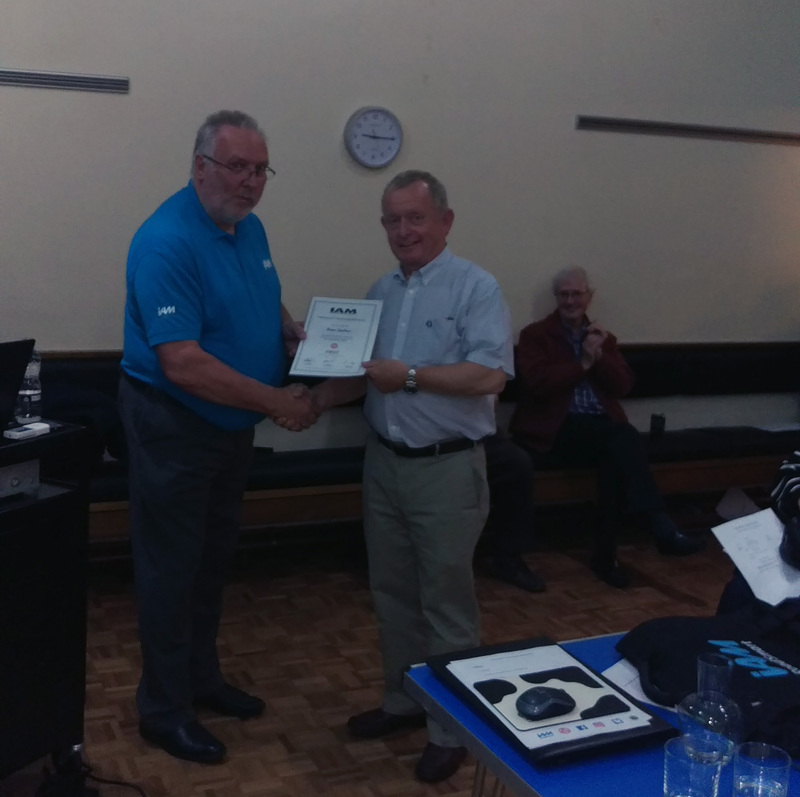 After the presentation by David the Group had the pleasure of seeing Paul Williamson, Group Chair, present Stewart Roper with his F1rst SFL Certificate. 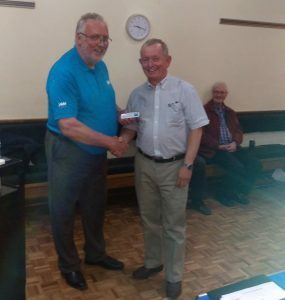 Well deserved by Stewart and a testament to both his driving skills but also to the guidance of Nigel Packer who was his Observer, (sadly not able to attend this evening). We are not certain whether it is simply the fact that people are thinking of other things, that they are in a hurry or that they are stupid but over the last few weeks it has become increasingly apparent that amber gambling has now become red running with people deliberately driving through red lights at the last minute putting themselves and other road users at considerable risk. Take care, as always, at junctions and as you cross do the sensible checks all around for emergency vehicles but also keep a very wary look out for people hurtling through red lights at the last minute especially if you are the lead vehicle in a queue. Do not even think of moving on amber, you shouldn’t in any case, but wait for green to be clear then add a second before progressing, the few extra moments and additional vigilance may save you a lot of time, hassle and cost. On 17th December 2015 The Group bought the concept of safer driving to seventy six pupils of SWBA in Bilston. A great afternoon and exciting end to the term for the pupils especially the two who each won vouchers to the value of £150. On 28th November 2015 Dr. Jonathan Hughes attended a Masters Qualification Workshop run by Mark Lewis, Director of Standards based in London. The intention of the workshop was to improve the Masters Qualification offering. 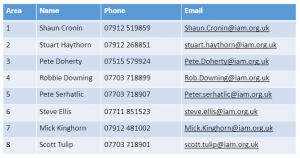 The following notes are those generated by Mark and his team following the meeting. On 28th November 2015 Nigel Packer attended the CEWW, (Central England and West Wales), Regional Forum on behalf of the Group. The following are his notes of that meeting.